Tom Cleverley's third goal in successive games gave Aston Villa a huge push towards Premier League safety as they beat West Ham. The midfielder scored from close range after Jack Grealish's cut-back on 31 minutes to move Villa four points clear of the bottom three. West Ham were livelier in the second half after an awful opening 45 minutes. Striker Enner Valencia headed in a cross from Brazilian substitute Nene, but was judged marginally offside. Victory means that Villa will secure their Premier League status with a win at Southampton next Saturday, regardless of results elsewhere. Tim Sherwood's side faced a nervous final 20 minutes after failing to build a bigger lead during a dominant first half. But the FA Cup finalists were well worth their third win in four league matches, with Grealish a creative threat and Christian Benteke's power causing problems. There was positive news too with the return from a hamstring injury of second-half substitute Gabby Agbonlahor, who missed a late chance to mark his return with a goal, after being sent clear by Grealish. West Ham felt they should have had a first-half penalty as Valencia was dragged down by Leandro Bacuna as they contested Morgan Amalfitano's corner, but referee Lee Mason ruled instead that Kevin Nolan had fouled Villa keeper Shay Given. Hammers manager Sam Allardyce also protested over the ruling out of Valencia's goal, believing that the Ecuador international was level with the last defender when he headed in midway through the second half. West Ham have managed just four Premier League away goals in 2015 - the joint-lowest total in the division, shared with Newcastle and Hull. But Villa had seen several chances come and go by then, with Hammers keeper Adrian punching out a Cleverley volley, Benteke slicing wide after finding space and Fabian Delph firing straight at the keeper before the goal arrived. West Ham, who have struggled for goals in recent weeks, did look more of a threat after Alex Song and Nene had replaced Amalfitano and Nolan at half-time. Nene was just off target with a couple of long-range efforts, while Given had to turn over former Villa defender James Collins' looping header from a corner late in the game. Villa, though, secured a win - and look to have done enough to ensure that, should former Chelsea business director Paul Smith's planned £150m takeover go through, he will be buying a Premier League club. Aston Villa manager Tim Sherwood: "I've no interest in other results. I've said that for weeks and weeks. It's in our own hands. We do our job. We win. "Today wasn't pretty, but we scrapped it out. We thoroughly deserved the win, no question about that. "When I have a cup of tea and watch this game back on Monday, I'll be quite comfortable watching it." West Ham manager Sam Allardyce: "Our cutting edge has been missing for many weeks. We don't have anybody who can score a goal. "It doesn't matter how many chances we create, we're not scoring. We'll struggle to win a game between now and the end of the season if we can't score a goal." Match ends, Aston Villa 1, West Ham United 0. Second Half ends, Aston Villa 1, West Ham United 0. Attempt saved. 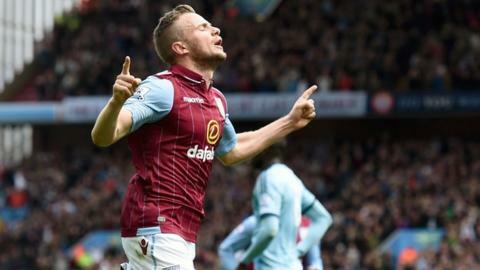 Tom Cleverley (Aston Villa) right footed shot from outside the box is saved in the centre of the goal. Assisted by Fabian Delph. Attempt missed. James Collins (West Ham United) header from the centre of the box misses to the right. Assisted by Stewart Downing with a cross following a corner. Corner, West Ham United. Conceded by Alan Hutton. Substitution, Aston Villa. Carlos Sánchez replaces Jack Grealish. Attempt missed. Gabriel Agbonlahor (Aston Villa) left footed shot from the centre of the box misses to the right. Assisted by Jack Grealish. Delay in match Christian Benteke (Aston Villa) because of an injury. Shay Given (Aston Villa) wins a free kick in the defensive half. Foul by James Collins (West Ham United). Foul by Alan Hutton (Aston Villa). Enner Valencia (West Ham United) wins a free kick in the attacking half. Attempt missed. Ashley Westwood (Aston Villa) right footed shot from outside the box is close, but misses to the left. Foul by Tom Cleverley (Aston Villa). Nenê (West Ham United) wins a free kick in the attacking half. Substitution, West Ham United. Carlton Cole replaces Mark Noble. Substitution, Aston Villa. Alan Hutton replaces Leandro Bacuna. Alexandre Song (West Ham United) is shown the yellow card for a bad foul. Jack Grealish (Aston Villa) wins a free kick on the left wing. Foul by Alexandre Song (West Ham United). Substitution, Aston Villa. Gabriel Agbonlahor replaces Charles N'Zogbia. Corner, Aston Villa. Conceded by Cheikhou Kouyaté. Offside, West Ham United. Nenê tries a through ball, but Enner Valencia is caught offside. Tom Cleverley (Aston Villa) wins a free kick in the defensive half. Foul by Cheikhou Kouyaté (West Ham United). Attempt missed. Nenê (West Ham United) left footed shot from a difficult angle and long range on the right is just a bit too high. Assisted by Alexandre Song. Delay in match Enner Valencia (West Ham United) because of an injury. Corner, West Ham United. Conceded by Shay Given. Attempt saved. James Collins (West Ham United) header from the centre of the box is saved in the top centre of the goal. Assisted by Mark Noble with a cross. Corner, West Ham United. Conceded by Ron Vlaar. Offside, West Ham United. Mark Noble tries a through ball, but Enner Valencia is caught offside. Delay in match Aaron Cresswell (West Ham United) because of an injury. Attempt missed. Charles N'Zogbia (Aston Villa) right footed shot from the right side of the box is close, but misses to the right. Assisted by Kieran Richardson. Corner, West Ham United. Conceded by Kieran Richardson. Jack Grealish (Aston Villa) wins a free kick in the attacking half. Attempt missed. Nenê (West Ham United) left footed shot from outside the box is just a bit too high. Assisted by Stewart Downing.